Agricultural crops consumed and damaged by elephants are most commonly the analogs of plants eaten by elephants in the natural habitat (fig. 8.1). Cultivated grasses, particularly the cereals and millets, are the most common targets of elephant depredation. In the moist tropics of Asia, the staple cereal, paddy (Oryza sativa), is a favorite target of elephants. In drier regions of both Asia and Africa, elephants consume a variety of cereals, chiefly maize or corn (Zea mays), sorghum (Sorghum vulgare), and wheat (Triticum vulgare) and various millets such as finger millet (Eleusine coracana), little millet (Panicum miliare), and bulrush millet (Pennisetum typhoides). Sugarcane (Saccharum officinarum) is another cultivated grass that attracts elephants. 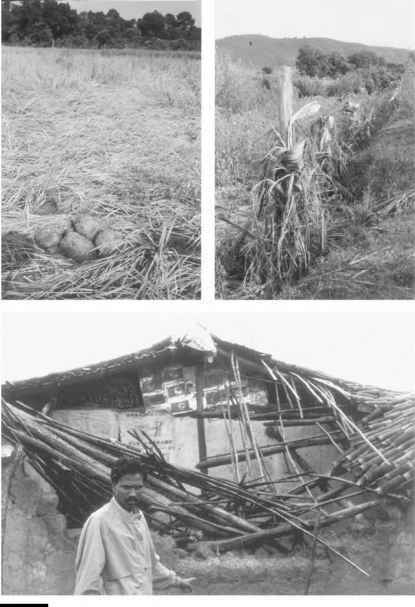 Damage by Asian elephants to paddy crop (top left), coconut trees (top right), and a house (bottom). into several dozen species. Most of these cultivated plants belong to botanical families such as Gramineae (grasses), Palmae (palms), and Leguminosae (legumes), which also constitute substantial proportions of the elephant's diet in the wild. Elephants are selective with respect to the plant parts they consume. When paddy or millets are in a young, vegetative stage, a clump of plants is uprooted and consumed entirely. More typically, these are preferred when they begin flowering and set grain. At this stage, a clump is uprooted, the terminal portion is chewed off and consumed, while the basal portion with the roots is discarded. By weighing several samples of whole plants and discarded basal parts, I estimated that only 62% by weight of finger millet plant is consumed. With sorghum and maize, the stalks bearing the spikes or cob, constituting about one-fourth of the plant by weight, are selectively broken and consumed, although elephants may also feed on the stem and leaves in the absence of flowering. Young coconut or oil palm may be uprooted and trashed until broken pieces of stem and leaves are suitable for consumption. From older trees, the leaves or the central rachis may be selectively removed; the last action kills the tree. Large coconut trees are even uprooted before feeding. Contrary to popular belief, elephants do not necessarily feed on fruits of banana plants, but rather crush the stem and extract the fibrous pith. Fruits such as mango and orange are usually selectively plucked, although in the process, branches may be broken and the tree damaged. A substantial part of the damage caused to standing crops in the fields may simply be due to trampling by elephants. In my southern Indian study, I found that only about 60% of the damage in finger millet fields where elephants had been actively feeding was due to actual uprooting and consumption of plants. The remaining 40% of the damage was due to trampling. In addition, elephants may also damage fields merely through trampling without any feeding. When a particular crop or a variety of crops is grown in small plots, the raiding elephants may exercise a distinct choice of one or more plots for feeding. I found, for instance, that bull elephants did not feed in finger millet plots in which the plants were in the vegetative stage. Rather, they walked through these plots, trampling some crop in the process, before reaching a plot with millet plants in the more attractive flowering stage. At any particular time when millet fields were in different phenological stages, the bulls distinctly biased selection toward fields with robust plant growth and crop that had flowered or set grain. When elephant family groups raid crops, much of the damage may be due to trampling of fields as they pass through but do not use for feeding. I found, however, that damage in finger millet fields utilized by them for feeding was not very different from that caused by bulls. Large elephant groups can obviously trample a considerable area of crop fields. In the Indian state of West Bengal, herds of 50 or more elephants trample paddy fields as they walk long distances between forest patches. Raiding by elephants is not confined to standing crops in fields. 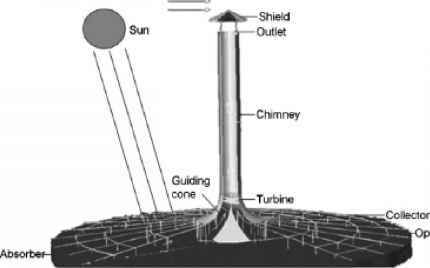 They also attempt to feed on harvested plants stacked in the field for drying (prior to threshing) or even raid grain stores by knocking over mud or thatched house walls. There are amusing anecdotes of elephants raiding locally brewed liquor stores in villages or even the imported, connoisseur's varieties kept in army camps near the jungle.